Like any good parent, my mom didn’t allow me to drink coffee. After a trip to Graaf- Reinet with my father, I returned a 5-year-old coffee- drinker. A distant relative/ coffee dealer prepared it for me and all the other kids on the block. It was served after a bowl of Kellogg’s Cornflakes. At just the right temperature, I drank the percolated brew. Since then, I instinctively flare my nostrils at anyone offering me tea. Something about the texture of coffee granules, the perfect measure of sugar, the accurate method in pouring hot water and a splash of milk says: tea and hot chocolate are for pansies! Of course, as my good chum Kate Chauncey has pointed out, the coffee granules are the gateway drug to plunger coffee and gradually, frequent visits to Vida, Illy, Seattle and Homeground. According to Café Bar: in 850AD an Ethiopian goat herder noticed his goats acting particularly lively and playful after feeding on the berries from a bush that was later to be known as an Arabica bush. He tried the berries himself and had a similarly uplifting experience. 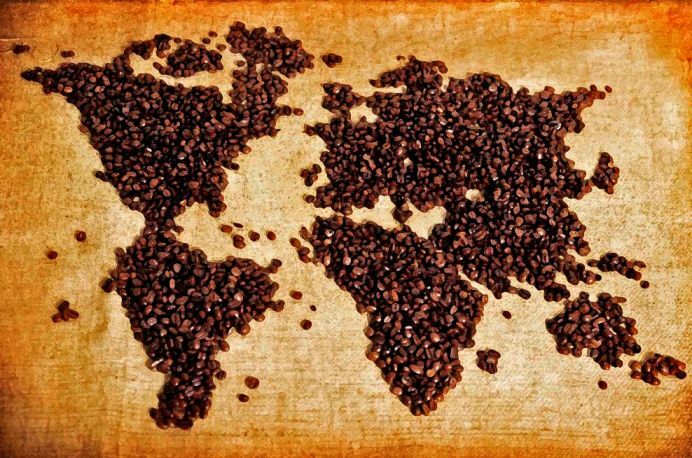 Thanks to this fellow, more than 2 billion cups of coffee are gulped everyday globally. However, for coffee farmers, my warm and fuzzy memories of early coffee addiction mean nothing. The café culture that has embedded itself in many societies barely affords them food for their families. Black Gold (the movie) explains that “Ethiopia is the largest producer of coffee in Africa. Over 15 million people in Ethiopia depend on coffee for their survival” and yet the international price of coffee is established in New York and London. The price of coffee, like many other primary goods, is at an all time low. Many farmers who depend on coffee for income are in debt or have been forced to abandon their farms or switch to alternative crops. If you want to put a face to United Nations statistics, coffee farmers and harvesters are some of the people “living under a dollar a day” (R7.08 today). This is despite the fact that since 1990, coffee retail sales have increased from $30 billion to $80 billion a year! Kraft, Nestle, Proctor&Gamble and Sara Lee are the four multinational corporations that dominate the world coffee market. I can just imagine their board members shrugging their shoulders and expressing fake sympathy to any coffee price negotiators, saying: “I wish we could do more but we cannot intervene in the market. Perhaps we can drop the farmers a few bags of wheat from the sky”. In any international forum, Africa is always the poor, black, snotty, sad, scantily dressed kid. This is no different for African countries at the World Trade Organisation (WTO former GATT), which is the “roundtable” for formalising and negotiating trade agreements. It is simply another forum enabling wealthier economies, countries or corporations to impose heavy prices at the expense of poorer countries like Ethiopia. This is a contributing factor to the low price of coffee. Negotiations for higher prices are placed at the bottom of the priority list. At the core of this blog is a wish for ordinary people to be aware of the on-going injustices that afflict countless Africans. I urge everyone who starts his or her day with a cup of coffee to watch Black Gold and Google “coffee price crisis” for more in- depth information. Besides having an opinion about the matter, what else can you do? Start buying and asking for Fairtrade coffee, which ensures producers get fair payment. Some of the onus is on consumers to demand a product that is not easily available. Visit Fairtrade Label South Africa for information on Fairtrade products available in South Africa.